Packed house settles in for Japanese cultural entertainment at Roosevelt Island's Cherry Blossom Festival. The Common Council's Cherry Blossom Festival Committee, just a half-hour after RIOC released a statement, raved about the entertainment in FDR Four Freedoms Park, justifiably, and how well they'd marshaled community support to pull it off. Note: Downloadable copies of both statements are attached below. "The visitors were dazzled by the performers and we received endless positive feedback," they said. Left unsaid was that few of the 30,000+ visitors congesting Roosevelt Island experienced that, the viewing area at the north end of the park filled to capacity with hundreds, not thousands of lucky guests. But we knew that three days ago, and painful difficulties so many felt outside the park's gates -- not enough toilets for even a small event, inadequate food and water supplies, porous security -- were what we hoped they'd address. RIOC -- the Roosevelt Island Operating Corporation -- for it's part, stuck to administrative routines, dedicating itself to face-saving evasions and, in some respects, self-serving omissions. 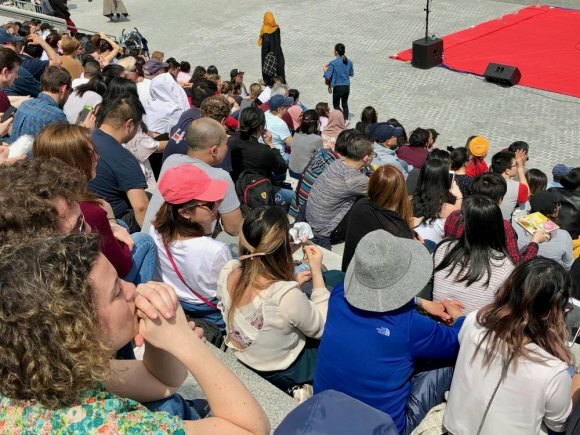 "While the event was highly successful, with great weather, fabulous entertainment, Japanese culture, and of course the beautiful cherry blossom trees, the island experienced overcrowding in its transportation hubs, at the Tramway, Subway, and Ferry," RIOC reminded everyone. Nothing in either statement takes responsibility, let alone apologizes, for causing our friends to be prevented from going home by a ten-block thick Queens traffic jam or for families forced to walk across the Roosevelt Island Bridge just to get water. 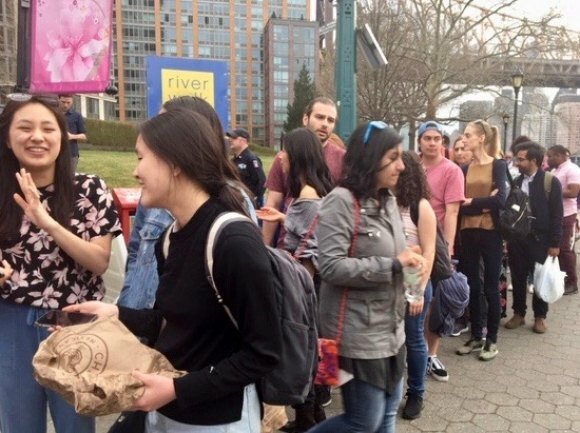 According to the Cherry Blossom Festival Committee, "The scope of the Roosevelt Island Residents Association is the creation, production, staffing, promotion and maintenance of the cultural integrity of the Cherry Blossom Festival’s programming," which pretty much threw a deserving RIOC under the bus. 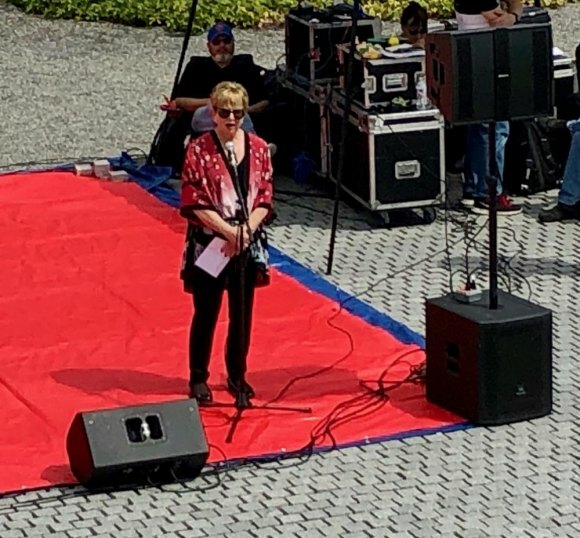 The group cheerfully fluffed off responsibility for food vendors or for advance, coordinated planning that might've reduced safety hazards and the eventual media thrashing overshadowing lovely events in Four Freedoms Park. "One of the quintessential elements of the traditional Japanese cherry blossom celebration," the committee continued, "is to witness to the actual popping of the cherry blossoms while picnicking under the trees." More embarrassing for those of us hoping someone involved might take an adult position was this, "It’s safe to say no one anticipated the overwhelming number of the many thousands of people visiting." That's simply a lie that RIOC echoed. The truth organizers fumble to avoid is that, on RIOC's Facebook page alone, more than 13,000 registered their intent to attend with a whopping 80,000 or so checking off "Interested." What small percentage of people living somewhere other than Roosevelt Island do you think check out RIOC's Facebook page long enough to check the box? And why didn't the patroons at 591 Main Street simply do the math? No one anticipated "the many thousands of people visiting?" A vocal group of disenchanted Common Council Members virtually screamed warnings on RIOC's doorstep, a week or more in advance. To no avail. The Daily, also, published the numbers and what they suggested about the eventual onslaught that froze auto traffic, left families without anything to eat or drink and jammed the subway station. It wasn't that "no one anticipated," it was that the organizers chose to believe in some sort of magical fantasy where everything fixes itself instead. And why would anyone expect them to do otherwise? RIOC screwups in the last year, which we'll skip listing here because the Cherry Blossom Festival results are stomach tightening enough, are the things of legend, and face it, no planning took place beyond the performance venue. Leave it to magical intervention from invisible forces. It's galling to see RIOC churn up the excuse/evasion machinery again, but what's more maddening is something a bit less obvious: As any mentally healthy adult knows, if you're unable to recognize your mistakes, you're unlikely to avoid repeating them. Lines at the Roosevelt Island subway station, late Saturday afternoon. That's a truth we see here, almost daily. The elephant in the room upon which RIOC's splashing invisible paint is security. In a word, it was abysmal. RIOC claims, "The RIOC Public Safety Department (PSD) partnered with the New York Police Department (NYPD) and NYCEM to provide additional on-island support." Although only careful word-crafting -- i.e. "partnered with," means next to nothing -- prevents this from being an outright lie, there is nothing to suggest that any planning, contingency or otherwise, took place. Crowds this size are an enticement for terrorists, both domestic and foreign, yet security heading into the festival was laughably porous. Laughably after the fact, that is, because we got away with it. Anyone could detour easily around the checkpoints by entering Cornell Tech's unguarded campus and circling back on the other side. Cars were allowed to leak through checkpoints simply by saying they were transporting performers, no other identity necessary. While RIOC crows about "no incidents or injuries," the facts are that we got lucky. Of course, there were "incidents" galore, no matter what RIOC President/CEO Susan Rosenthal claims, from near panic in the subway to outrage over traffic jams stretching back to the Pulaski Bridge. That's right, almost to Brooklyn. If not "incidents," what does RIOC think lit up Twitter for hours on end and fueled a media frenzy? "PSD was in contact with the Metropolitan Transportation Authority (MTA) to ensure there were no interruptions in subway service to Roosevelt Island," RIOC argues, just weeks after an interruption the MTA promised not to make sent RIOC scrambling to explain that they can't control anything their sister State agency does. On Saturday, the MTA as well as NYPD reacted admirably, but it was no thanks to RIOC, which didn't include either in planning for the festival because they barely did any in the first place. Keeping in mind that a renewed initiative to promote the virtues of living in Island House includes Saturday afternoon open houses, how many people are now permanently turned off about living here after witnessing or hearing about this spectacle? How many now see Roosevelt Island as a dull-witted outpost isolated, unable to sustain basics and difficult to reach in the middle of the East River? How many times will NYC media hark back to this mismanaged event? “Future Cherry Blossom Festivals, and other potential events of this scale, will be the subject of upcoming discussions among RIOC, its Board members, and RIRA now that greater NYC has discovered our island,” stated Susan Rosenthal, President/CEO of RIOC. Someone wake Rosenthal up and tell her about Cornell Tech and FDR Four Freedoms Park, both of which bring visitors as well as year round attention to Roosevelt Island. And only incurable optimists will be heartened by her pledge of "upcoming discussions." You know about meetings among government officials, right? Media events meant to suggest action that's not really taking place. 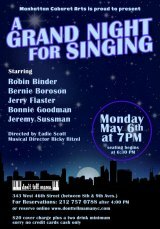 “Roosevelt Island may no longer be the best kept secret in the city,” Rosenthal blissfully added, regurgitating a lament from the 1990s.